Anthracnose diseases caused by Colletotrichum cereale (graminicola) have been reported to be a major cause of the death of annual bluegrass during the summer months. The pathogen may cause a foliar blight or a rot of crowns, stolons, and roots. 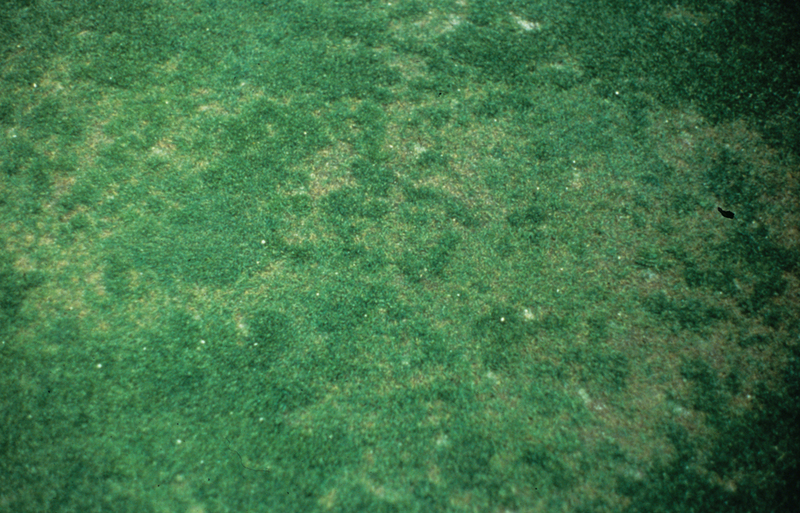 In Poa annua the disease appears throughout the season, while on Agrostis spp. it most often occurs in summer or early autumn. Symptoms of foliar blight are most evident during the summer stress period and include a yellowing to reddish brown discoloration of leaves and a general thinning of the turf. The distinctive fruiting bodies (acervuli) of the fungus with protruding, black hairline structures (setae) can be observed with a hand lens. Basal rot occurs when the crown tissues become infected and scattered plants or small patches of plants turn yellow and die. Close examination of the infected stem base reveals a water-soaked and black rot of the crown tissue. Spring outbreaks on annual bluegrass greens can be very destructive. Basal rot can be extremely difficult to suppress when it becomes a chronic problem on annual bluegrass greens. In warm weather, turf infected by anthracnose basal rot turns reddish brown or yellow and the turf thins out in large, irregularly shaped patterns. Colletotrichum cereale is particularly damaging to annual bluegrass, but has also been reported on creeping bentgrass, Kentucky bluegrass, fine-leaf fescues, perennial ryegrass, and bermudagrass. 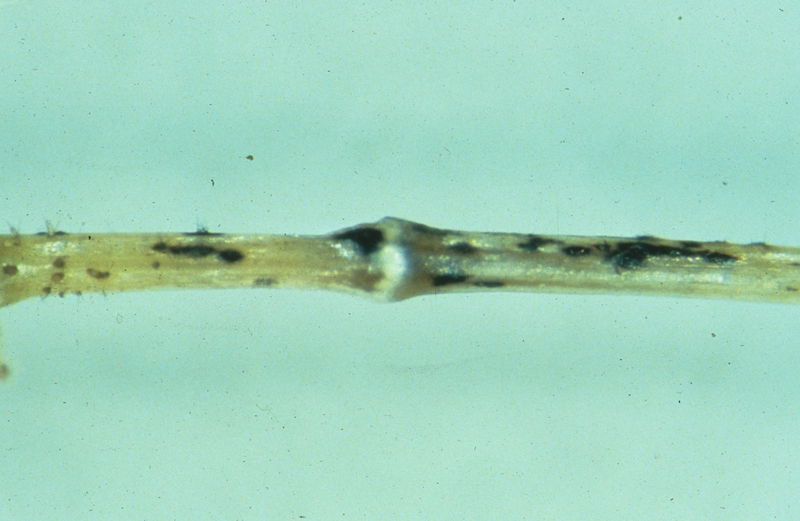 The pathogen seldom attacks both P. annua and Agrostis spp. in the same green or golf course indicating a degree of host specificity among isolates. Anthracnose survives in plant debris as a saprophyte or as a pathogen in infected plant material and is favored by conditions that stress the turfgrass such as low fertility, high temperature stress, low mowing height, poor soil drainage, compaction, and heavy traffic Disease development is favored by high humidity, shade, and any condition that allows excess water to remain in the leaf canopy. Conidia can be spread by wind, water, or machinery. Ultra-low mowing (0.125 in), increased mowing frequency, lightweight rolling, and abrasive grooming practices such as sand topdressing have long been thought to increase anthracnose severity. Recent research at Rutgers University has challenged these long held assumptions. Research suggests that frequent, light sand topdressing has a cumulative, beneficial effect, although this practice initially enhances anthracnose. Such topdressing appears to protect the crown from the stress of low mowing heights. Alleviate conditions that cause stress to the turfgrass. Preventive applications of fungicides are recommended where the disease is a chronic problem. Fertilize with complete fertilizers, avoiding deficiencies of potassium and phosphorous. Water deeply and infrequently. 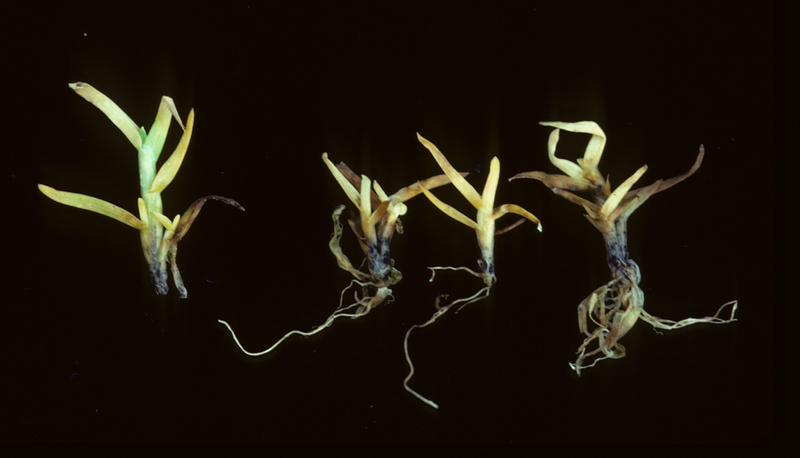 Basal rot anthracnose is enhanced by both excessively wet or excessively dry conditions. Irrigation at 60-80% of ET (evapotranspiration) is preferred for anthracnose management. 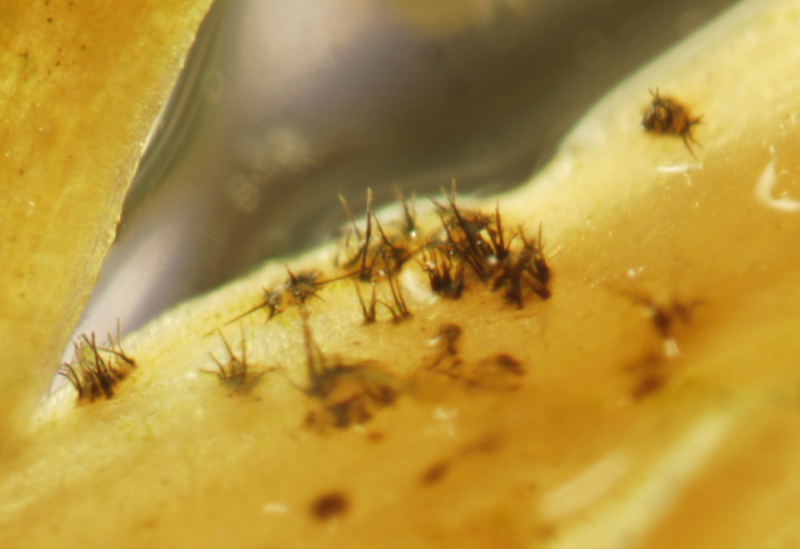 Avoid abrasive grooming techniques when the disease is active. Increase mowing height and reduce mowing frequency. Mowing below 0.125 inch should be avoided. Cutting heights of 0.141 inch and slight increases in mowing height can significantly reduce disease severity. Green speed can be maintained by rolling. Reduce soil compaction by core aeration in spring and fall. Minimize leaf wetness by improving air circulation (pruning of trees and shrubs) and/or early mowing or dew removal. Wash mowers when moving from infected areas. If renovating greens, consider bentgrass cultivars with moderate resistance to anthracnose. Preventive fungicide applications are more effective than curative applications. For basal rot, a systemic fungicide should be applied and watered in to reach the crown area. Follow with a separate application of chlorothalonil at a high rate. Repeated use of Group 3 fungicides should be avoided during the summer stress period to avoid growth regulator effects.